Conventional wisdom has it that Apple has reached its peak and can only disappoint from now on. Yet, many financial facts don’t make sense. The market is too harsh with Apple compared to its competitors. But when it comes to products, there is an unsettling detail: there was no product release during fiscal Q2 2013. While Apple is certainly not doomed, its future looks gloomy. That’s why today’s earnings will be important for the company. Apple’s growth has been incredible over the past two years, with double-digit growth for sales and profit. For years, Apple bloggers have vigorously criticized analysts’ expectations regarding Apple earnings and units sold. Basically, Wall Street analysts were setting the bar too high for units and market share, and too low for profit and sales. It led to distortion. With a very minor market share, Apple was able to capture a big profit share. The company reported hit after hit after hit — that’s why Apple shares were doing so great even though sales were “disappointing” according to some analysts — the bottom line is more important than anything else. But now, analysts have caught up and Apple is only able to pull out mixed earnings compared to estimates. Even iPhone sales are now below analysts’ expectations. The company was supposed to sell between 6 million and 10 million iPhone 5 during opening weekend. In reality, it sold 5 million units. As a reminder, for the first weekend alone, analysts predicted sales of 1 million iPhone 4 and 2 million iPhone 4S, compared to 1.7 million and 4 million actual units sold. This time around, analysts have to lower their expectations to get closer to reality. Fortune’s consensus puts Apple’s Q2 2013 revenue at $42.6 billion with estimated earnings per share of $10.21. Revenue would still be up 8.7 percent year over year. But it’s disappointing given the incredible growth trend over the past couple of years. One of the reason is that gross margin will be lower than what it used to be. Last year, Apple reported a 47.4 percent gross margin. The company now expects a 37.5 to 38.5 gross margin. Over the past six months, Apple was considered a flagging company based on multiple metrics. However that is far from the truth. There are a few finance facts that just don’t make sense when it comes to Apple’s outlook — Apple shares dropped below $400, a 16-month low. It’s easy to see that disparity if you compare Apple to other public tech companies. When it comes to market capitalization, Apple has shrunk a lot. On September 19 2012, its market cap was $656.51 billion — it now is $374.37 billion. It represents a 43 percent decrease in seven months. While the company’s market cap was very high, its downturn is even more impressive. To put it into perspective, this market cap decrease is greater than the market capitalizations of Amazon, Facebook, Yahoo!, HP, BlackBerry and Nokia combined. The market cap graph is very similar to the P/E ratio graph because Apple’s earnings are still steadily growing year over year. Only the stock performance disappoints. On September 19, shares were trading at $702.10. Other companies, such as Google, have experienced troubled times as well but have gotten back on their feet — from $710 to $260 then back to $600 in less than two years. When it comes to analyzing the stock market, irrational behaviors are still very dominant and that’s why it is too early to rule out Apple shares. For example, Sterne Agee updated its price target yesterday from $630 to $610, sill way above today’s price. As John Gruber points out, Apple is not friendly with investors. Even though it has started handing out dividends, the company still has more than $130 billion in cash. Investors consider that Apple should actually use this cash for investments, dividends and other financial activities. In the meantime, the company will continue to suffer on the stock market. In addition to changes on the stock market, Apple products are at a turning point. Due to the incessant product releases during fiscal Q1 2013, no product was released or even announced during Q2 2013. It hasn’t been this long for years. In the past, shares have been boosted by the anticipation of a new product, such as the iPhone 5. The iPad mini is out, now what? 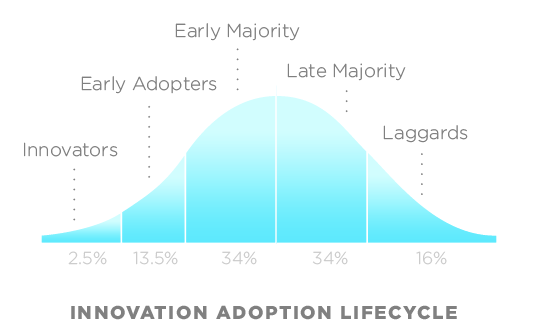 As adoption graphs will tell you, in order to succeed, a company needs to perpetually innovate, even if it means out-innovating and killing your own products. Apple has been very successful at this, killing the iPod mini, releasing an iPad that could compete with its computers, etc. Yet, it wasn’t the case recently. Volatility and uncertainty kicked in. The next breakthrough innovation could be a watch or a TV, but those two products are not ready for prime time yet — if they even exist. It is unclear what Apple will release over the next six months, incremental iPhone and iPad updates aside. Apple used to be at the top of the world with the iPhone 3GS. It could simply put a faster processor and call it “3GS” to create a massive success. These days, Samsung is eating away at Apple’s market share and HTC is finally innovating again. Even though the iPhone 5 was a massive improvement over the iPhone 4S, naysayers still found it too similar to its predecessor. Since then, iPhone sales have been great and nobody can call it a commercial failure. But Apple needs to create ah-ha moments again, because it is a company that relies a lot on storytelling. It all comes down to perception. Is Apple doing well? If you consider its earnings, it is still a growing company with massive successes, such as the iPhone 5 and the iPad product line. If you consider its long-term outlook, Apple’s growth prospects are now gloomy. While we wait for breakthrough innovations, today’s earnings will be a great indication of the company’s performance without any new product release. It is a post-holiday quarter and a transition period. Apple could miss expectations for Q2 2013 while still growing, but many questions would remain unanswered regarding Apple’s future. Without any new product in sight, it’s hard to tell whether Q3 and Q4 2013 will be as successful as Q3 and Q4 2012.